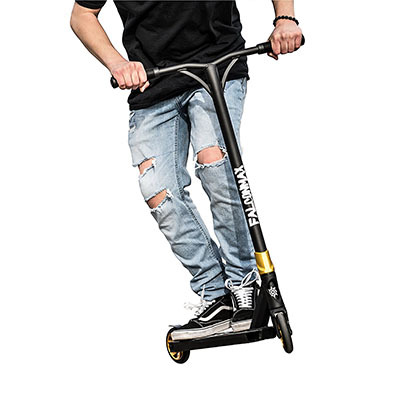 The purpose of this article is to take a look at some of the best stunt scooters on the market and figure out what makes the best stunt scooter for kids. Doing so requires looking at features like weight, size, ease of maintenance, and even style to figure out which model suits your little one. Stunt scooters are becoming increasingly popular among extreme sports fans. Before kids can graduate to the larger, more feature-filled scooters, though, they’ve got to start with something that’s a bit closer to their own size. Durability is the name of the game for this scooter. It’s perfect for any kid who wants to learn how to grind on a scooter, something that can easily cause a lot of wear and tear on scooters with less robust decks. It’s the best stunt scooter for kids who are really going to put a scooter through its paces, though it still works well enough for almost any young rider. It doesn’t have a lot of the special construction features you might expect from some of the other names on this list. Nonetheless, the fact that it can take a beating really does make it an ideal fit for anyone who is just learning how to ride. 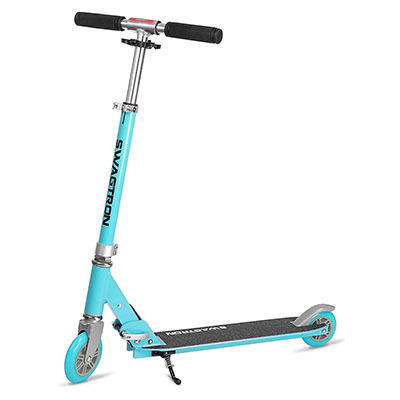 This model from Swagtron is definitely a solid pick if you’re looking for the best stunt scooter for kids, even if the name leaves something to be desired. Name aside, it’s a great scooter that can really grow with a young rider. It’s billed as perfect for ages seven to fifteen, with an adjustable stem that will grow along with a rider. It’s also very light, which makes it easy to cart around as well as perfect for doing tricks. 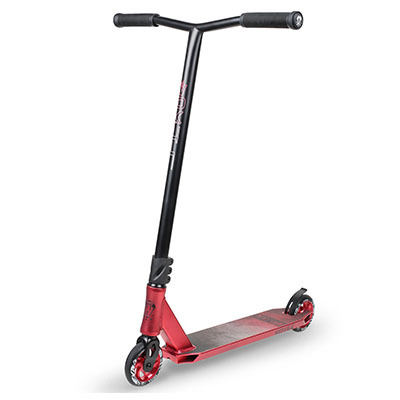 Combined with a smooth rider and good handling, this makes for a good entry scooter for any young rider who wants to get better on a scooter. Vokul’s fairly well known in the world of stunt scooters, so it shouldn’t come as a huge shock that it makes at least one entry on the list of best stunt scooter for kids. 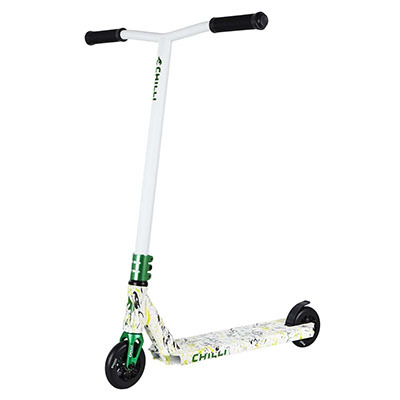 While it does provide a child with a smooth and easy ride, one of the best features of this particular scooter is how easy it is to put together. Tighten three nuts and you’ll be good to go – no worries about small parts or dealing with strange pieces. This is a good scooter for those who are just starting to figure out how they want to ride and don’t want to make a huge investment quite yet. Induxpert markets its FMX scooter as a true trick scooter, and much of that has to do with the design. While it’s impossible to know how much truth is behind the company’s claims of having pros design every component, the fact is that this scooter is incredibly responsive. On top of that, the Induxpert model is also a good fit for older kids, and even teens. That’s because it’s easy to ride even if you are over six feet tall. The real selling point should be the construction, though. This is a hard scooter to wear out and it really will reward the rider’s perseverance by responding to his or her commands easily. The Chili Reaper is a step above what you’d generally find among the best stunt scooter for kids, to say nothing of the average scooter. This is something that’s a bit more akin to what the pros use. Thanks to some awesome technology used in the development, kids will enjoy a smoother, more controllable ride. While this one isn’t a great fit for very young children, it’s one of the few scooters that can grow with a rider very well. It’s not quite going to take your child into his or her adult years, but it’s still a great fit for teens. Fortunately, stunt scooters don’t take an awful lot of maintenance compared to other rideables. While there are certainly things at which you need to look, be aware that your primary tool is going to be either a screwdriver or a hex wrench when dealing with most problems. Your primary goal should always be making sure that the handlebars are tightly connected to the stem. If they go loose, you could have a major problem when attempting a trick. Give the handlebar and stem a quick once-over before you start riding and tighten them whenever necessary. It might keep your child from riding for a few extra minutes, but it is more than worth the effort. Any one of the scooters listed here has a good claim to being the best stunt scooter for kids this year. 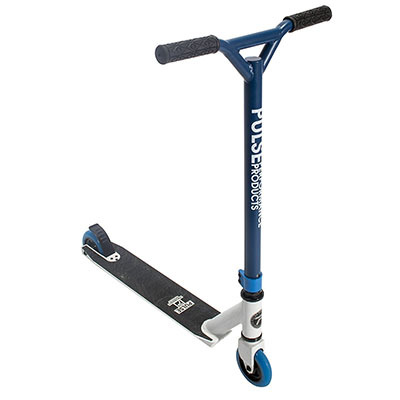 These scooters are all great for growing riders and can stand up to the punishment that tends to come with learning how to ride. If you’ve had and experience with one of these scooters – or if we have left a great scooter off the list – don’t keep it to yourself – get in contact with us and share your story.